Boo has been a fascinating character from the very beginning. The big furry guy was overlooked for the sheriff job and had to welcome an outsider who took the position. Despite his resentment of Sheriff Clara Bronson, he kept it professional and did his job. He's got his own baggage, but it hasn't been covered very much. 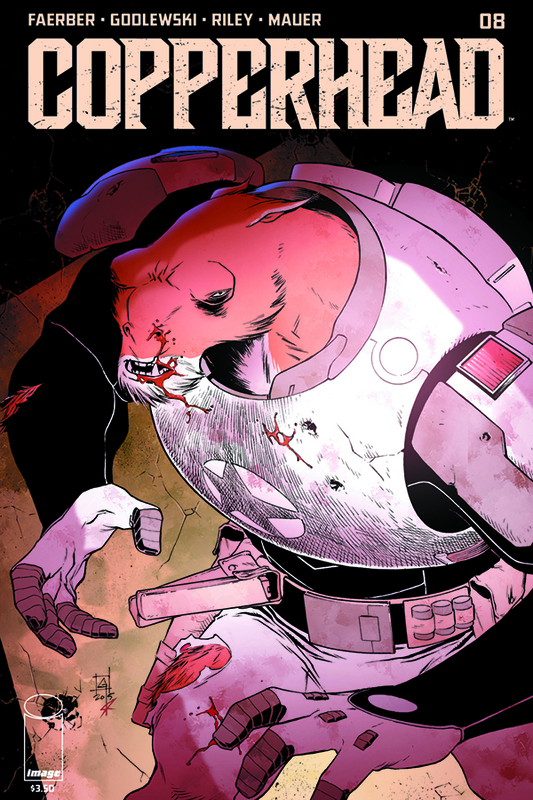 In Copperhead #8, Boo gets the spotlight as he's been taken hostage by a band of outlaws. The issue opens up with a different hostage situation with a curious twist but doesn't play out the rest of the issue. Back with Boo's kidnappers we get to know some of the group's dynamics. There's a distinct hierarchy with some sibling rivalry tossed in. The real conflict comes between Boo and one of his captors, Brexinfoyle. Both veterans of the war each emerging on opposite sides of the law. He sees Boo as a sell-out for working for the enemy, turning his back on the resistance and bowing to the humans. It creates some tension and conflict within a conflict. Jay Faerber adds another layer of world building by adding this type of subtext in the story. Boo gets to shine as the honorable and resourceful hero for once in the series. As usual, Scott Godlewski's great designs and layouts paired with Ron Riley's vibrant colors give Copperhead its brilliant look. The varied angles and panel layouts help give the story energy. They've helped make the book one of the best-illustrated comics. Boo is in a heap of trouble. Can Bronson save him in time? 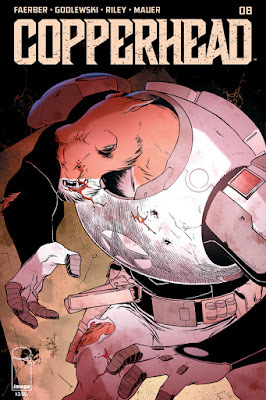 Copperhead is off to another great arc.